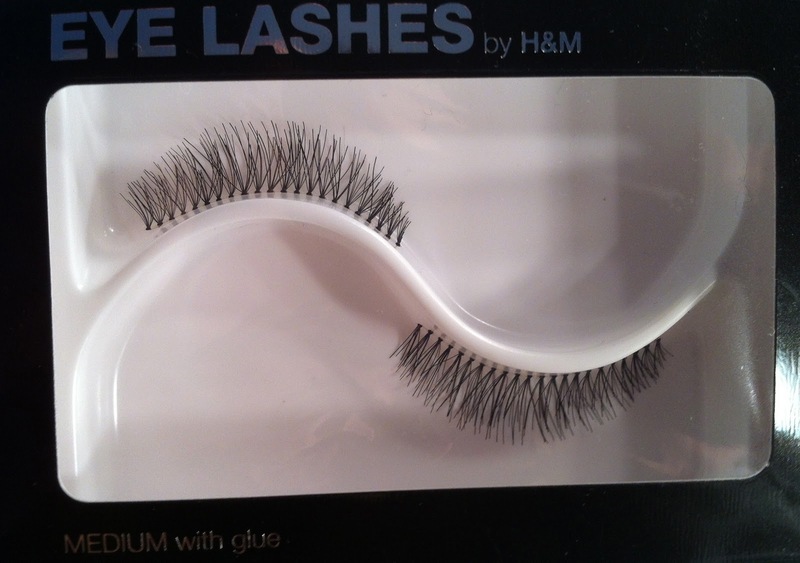 Make Up For Dolls: H&M Medium Lashes - shout out! I love lashes, but I rarely have time to apply them. My usual makeup routine involves no more than ten minutes spent in front of the mirror, which definitely doesn't leave time for lashes. 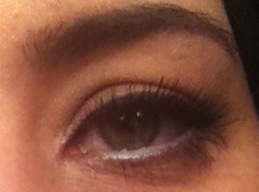 But for nights out, for a real doing-yourself-up experience, lashes (for me!) are a must. They can be as OTT or as tame as you like, but whether you go for strip lashes or individuals, I really think that they can oomph up a look to the nth degree! I am generally on the look-out for good inexpensive, natural-looking lashes; I have a bunch of weird-and-wonderful feathers-and-or-mad-colours variety, and some long-and-lush-looking lashes when I want to go all-out on a night-out, but natural lashes that are not cheap and not plastic-y looking are hard to find, the ones that you'd occasionally like to wear on a day-out. So when I found these ones in H&M I thought I'd give them a whirl. A fiver isn't really a bad price! These are not quite cheap-as-chips, but they're certainly not crazy expensive either. 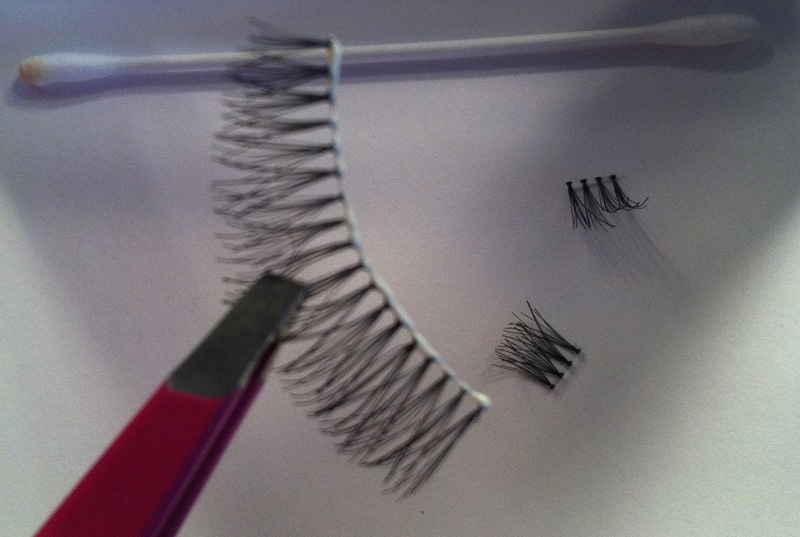 If you look after your strip lashes, clean them down and disinfect them after use, you'll get a few wears out of them. The next-up ones are around the €7 mark, so a fiver isn't bad. First impressions? Although these are not made from natural hair, they certainly appear natural enough. I like the fact that the band is really really thin, it makes them easier to blend into your natural lashes, and easier to apply, and in general more comfortable to wear. They are far too long, like most lashes, but that's easy, just cut them to size, remembering to cut from the end that has the longer lashes attached. You may or may not need to use mascara or a lash comb to mix the false lashes in with your own lashes; I usually do - I think my lashes, like the rest of me, are gradually succumbing to gravity :-( and no longer point upwards as they should! As mentioned, I never ever recommend the glue that comes with lashes. 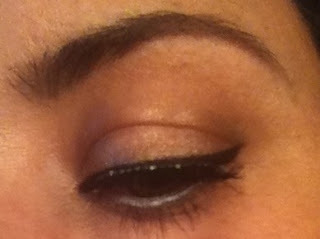 It can be either too strong (and your falsies never want to part company with your eyes!) or too weak (and the strips fall off in the middle of the day/night). I recommend Duo Glue, but if you're allergic to latex, look into getting yourself some latex-free glue (both Revlon and Illamasqua do latex-free lash glue). Duo Glue dries down to be transparent, but if you need to, you can always go back over it (once dried) with your eyeliner to hide the glue/lash seam (you may need to do this step for false lashes with a thicker band anyhow - look here if you want to see a tutorial on eyeliner flicks). The final result; nice and natural, just slightly longer and fuller than my own (incidentally, I cut down the left-over lashes and added them underneath my lower lashline also). Not much to say except that for natural lashes, at a fiver, these are really not bad at all. They wore well and I'll get another few uses out of them yet.